"Be careful of people. They will arrest you and take you to be judged. They will whip you in their synagogues. You will be taken to stand before governors and kings. People will do this to you because of me. You will tell about me to those kings and governors and to the non-Jewish people. When you are arrested, don't worry about what to say or how you should say it. At that time you will be given the things to say. It will not really be you speaking. The Spirit of your Father will be speaking through you." While opposition and persecution are real possibilities for followers of Jesus, he does not leave us unequipped for such circumstances. First, he does not paint a rosy picture, so that we will not be caught off guard. He wants us to know the truth about what lies ahead. Second, we must practice caution because there are those wanting to do us harm. We are not trying to get into trouble; it may happen because of what we do, but it is not our goal. Third, Jesus reminds us of our purpose of appearing before others for the sake of the Gospel: we are to be witnesses to the world. Fourth, we are not to worry exactly how to defend ourselves, for the Spirit of God will help us know what to say. Jesus makes it clear that we may suffer for our faith, but he wants us to know that we will not be unprepared or abandoned when we do! 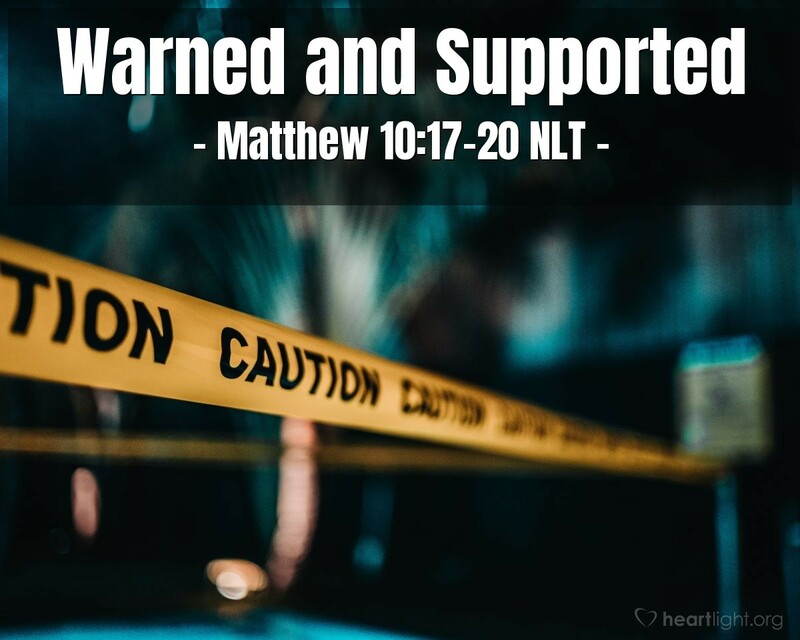 His words are a careful and practical balance of warning, assurance, mission, and support. Holy and righteous God, I pray now for believers all over the world who are facing persecution and harassment for their faith. Please bless them and fill them with your Spirit to give them words to say to make a lasting redemptive impact on the hearts of those who oppose them. In Jesus' name I pray. Amen.